Carry less, do a lot more. All the productivity and apps of the full Ubuntu desktop, built into your Android phone. London, 22nd February, 2012: Canonical today unveiled Ubuntu for Android, bringing the world's favourite free desktop experience to multi-core Android smartphones docked with a keyboard and monitor. Use Android on the phone and Ubuntu as your desktop, both running simultaneously on the same device, with seamless sharing of contacts, messages and other common services. The phone experience is pure Android - it's a normal Android phone. When the device is connected to a computer screen, however, it launches a full Ubuntu desktop on the computer display. It's exactly the same desktop used by millions of enterprise and home users on their Ubuntu PCs, and includes hundreds of certified applications, from office productivity to photography, video and music. 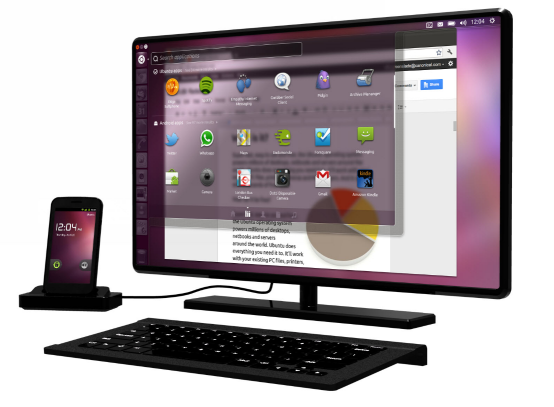 Ubuntu for Android gives mobile workers a company phone that is also their enterprise desktop. Government and private institutions have embraced Ubuntu on the desktop because of its ease of use, security, manageability, superb range of native applications and excellent support for web browsers like Chrome and Firefox. The desktop can also include Windows applications, using thin client and desktop virtualisation tools. Today's IT departments commonly support a PC and at least one desktop phone for every employee. Many also provide and manage mobile phones. Ubuntu for Android presents a compelling solution to IT complexity by reducing that burden to a single device. The first PC for the next billion knowledge workers could be a phone - but they won't just want to use it as a handset. They will want all the flexibility and productivity of a full desktop, as well as the convenience of a smartphone on the move. Ubuntu for Android represents the first opportunity for handset makers and network operators to address this growth opportunity in emerging markets. "The desktop is the killer-app for quad-core phones in 2012" says Mark Shuttleworth. "Ubuntu for Android transforms your high-end phone into your productive desktop, whenever you need it"
Manufacturers targeting the corporate phone, as well as the next-generation enterprise desktop and thin clients can easily add Ubuntu for Android to their smartphones. The customized version of Ubuntu drops in cleanly alongside the rest of Android, and the necessary Android modifications are designed for easy integration. Hardware requirements include support for HDMI and USB, standard features in high-end handsets planned for late 2012. Ubuntu for Android justifies the cost to enterprise customers of upgrading to higher bandwidth 4G connections and contracts. Cloud apps like Google Docs work best with a full desktop, and shine with the lower latency of LTE. Network operators can deliver their own branded applications and services as part of the Ubuntu desktop, in partnership with Canonical. Canonical leads the traditional Linux ecosystem in support for the ARM architecture, having co-founded Linaro (linaro.org), the consortium dedicated to the unification of Linux on ARM and the simplification of Android integration and delivery. That industrial experience, combined with Canonical's long-standing leadership in desktop Linux and deep relationships with global PC brands enables Canonical to deliver an ARM-optimised desktop tightly integrated with Android, on silicon from a range of ARM vendors.